Terk's LF-30S is a wireless A/V transmitter that could be a solution for getting a composite video signal from point A to point B in the event that cables aren't feasible, like sending a DVD player signal to a TV in the garage without moving the DVD player into the garage. The Terk LF-30S Wireless A/V Entertainment Expansion System transmits video and audio sources to a TV in any room, through walls and floors, providing full two-way remote control operation from anywhere in the home, with an effective range of up to 150'. 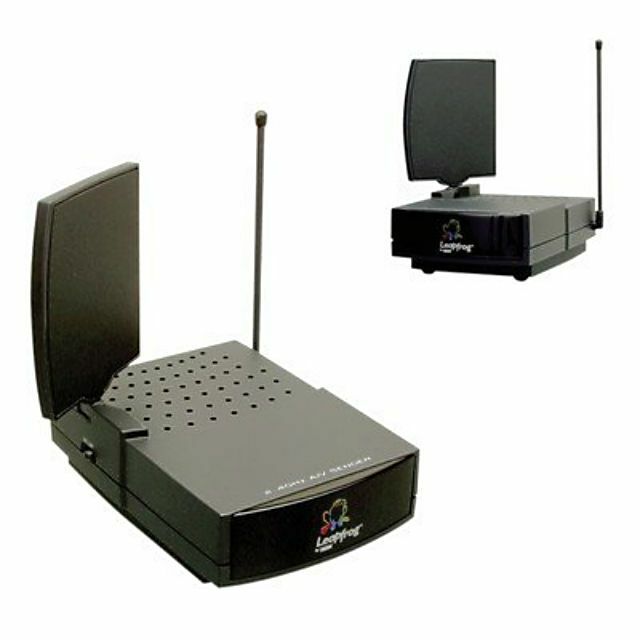 It works with TVs, satellite receivers, DVD players and most other A/V components. In the box, you get a transmitter, receiver, IR extender, power adapters and cables. The transmitter and receiver need external power to work. The LF-30S is easy to setup. The back panels on the transmitter and receiver are clearly labeled, which makes setup easy. One nice feature with the LF-30S is the IR extender, which allows me to operate my satellite receiver from another room. The way it works is cool. You plug the IR extender into the LF-30S transmitter and then put the extender in front of the transmitting device's IR sensor. This is a convenient feature because it makes sense to want to operate the device you are transmitting while watching it. I used the IR extender with a DVD player and satellite receiver with success. Both components were in different rooms from the viewing device and I was able to control them without problems. While I didn’t have room to test the 150' range, I was able to receive a good signal from over 60' away with a series of walls in between the transmitter and receiver. Essentially, the signal went from one end of the house to the other. I used the LF-30S to transmit video/audio from a DVD player, satellite receiver and digital camcorder. I was concerned that picture/audio quality would be sacrificed by sending the signal through the open air. However, any concerns were quashed because the picture and audio were just as good as if played without the LF-30S. When transmitting the signal around corners without adjusting the reception, the picture was slightly scrambled and the audio had a light buzz. However, most disturbances were easily corrected by adjusting the antennas on the transmitter and receiver. Antenna adjustment was easy but might require two people – one to adjust the transmitting antenna, the other to offer feedback when an acceptable signal is acquired. The only time I didn’t get any signal disturbance without adjusting the antennas was when the transmitter and receiver were in the ‘line of sight’ of each other. There was a downside to the LF-30S. While the receiver connected to a device via coaxial and composite, the transmitter only connected by way of a composite. Since the unit operates on the 2.4 GHz frequency, it will conflict with many cordless telephones (not cell phones). During the product test, I was not able to get a dial tone on my cordless phone while the LF-30S was turned on. I did receive incoming calls, but could not answer them on the cordless phone because of the interference. Also, I had some problems with the reception, especially when moving around the receiver. The disturbance was minimal and ended when the movement ceased. Another glitch was with the audio. At times, it was difficult to get rid of the low buzz on the sound. The noise wasn’t overpowering, but could be annoying to some people if not corrected by adjusting the antennas. Overall, I am impressed with the LF-30S. I can see how this device would come in handy for those wanting to watch television or listen to music in a place that isn’t equipped to do so otherwise, like in a garage, by a pool or in a room not wired for cable/satellite. The bottom line is that this product works as good, if not better than I expected. What can I do if I'm not allowed to run a TV cable to my bedroom?